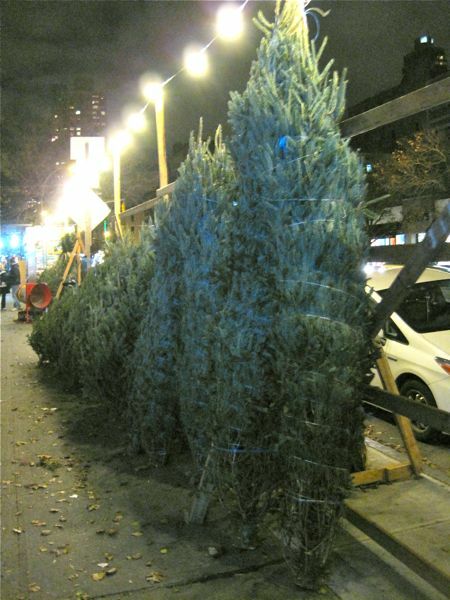 Here are some of the trees on a New York City corner, the day after Thanksgiving! They seem to be out earlier and earlier, with some Christmas decor up in the city days before the Thanksgiving holiday… The humongous tree at Rockefeller Center was already up and being decorated the week as well! Meanwhile, on the plane ride home, I watched a short feature on aritificial Christmas trees manufactured in China, which produces some 80+% of all artificial trees on the planet! Yipes! And they don’t really celebrate Christmas, do they? The factories that make the trees are HUMONGOUS, several football fields worth of covered floorspace for just one manufacturer alone! It was quite a revelation. At any rate, fresh or artificial, I hope you guys that celebrate Christmas have your trees up soon. In Manila, you can actually get fresh Christmas trees at S&R for less than PHP4,000, which is quite reasonable given the distance they have travelled, but they are a couple of feet short for us… :( We have purchased several of them in the past, here, here and here, and they provide a nice fragrance to our home for a fleeting week or two. remembering christmas trees of long ago … they were fresh pine trees, fresh scent and all. Waking up to fresh scents of pine in the morning in your living room – wonderfully priceless! i’d just been to legazpi city and when i saw all the beautiful christmas decor made of abaca and other natural stuff, i decided on a no made in china, all natural theme for my christmas tree this year. i was very happy with my finds, and very happy with the way my tree turned out, until i realized that the tree itself and the lights are made in china, of course. oh well…can’t have it all…. I have an artificial tree this year, pero ang ilalagay kong decor are mini bayongs that I bought from ilalim ng Qiuiapo. Ewan ko lang kung matapos ko kasi I have some medical issues at medio hindi ko maasikaso ang pag-decorate ng house ko. Babawi na lang ako sa mga ibang houses. Wreath and centerpiece only for this year…I will enjoy reading about your Christmas trees, MM and fellow-readers! https://www.jonesfamilyfarms.com/. I just love the scent of a real tree. I”ve lived in North Carolina for more than 2 years and lived close to a Christmas Tree farm…gosh, they smell so fresh The owner/caretaker said that it takes 3-4 years for a good one to sell. And whenever I see fresh Christmas trees sold at the store, it reminds me of that farm. Here in Houston though, there are nearby commercial farms that you cut the trees yourself, drag it to a road where a “hay ride tractor” picks you up, then you pay for it at the station. It is a fun thing to do with the children. The trees though are much more expensive than those sold in the market. Manhattan is the most beautiful between Thanksgiving and New Year’s imho. I used to go every year but haven’t been back for like 5 years now. Hoping to go back soon. Fresh tree trick: after cutting off an inch or two of the trunk as you’ve suggested, the first water poured into container should be the hottest you can get out of your tap. Hot water will open up the tree’s veins which likely have hardened sap and ensure that the tree will slurp up water more efficiently. If you don’t have flower preservative, a tablespoon of Clorox bleach is a good substitute. I also find that subsequent watering with warm water seems to work well. 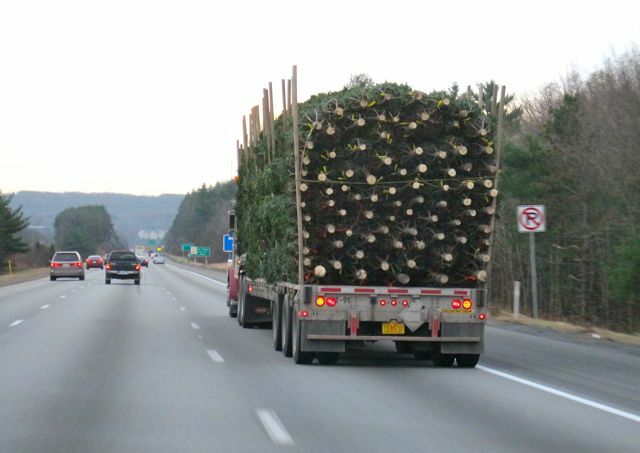 A little trivial info – I always had in mind that the state that produced the most Christmas trees would be Oregon or Washington or even California, but I was recently informed that it was none of those. Believe it or not, it’s Pennsylvania. May God Bless the Souls of those that perished in Newtown, especially the 20 little children. Find your children and hug them and let them know how much they are loved. Ahh..christmas time…childhood was always remembered with pine tree as the christmas tree sending out a very nice smell all over…memories of happy christmases in the bukid (Malaybalay,Bukidnon)..Happy Holiday MM and Family and the MM virtual family! Good day, i am a member of the Dueg Upland Farmers Marketing Cooperative at Sitio Dueg, Brgy. Maasin, San Clemente, Tarlac. Dueg is more or less 3,000 feet high and we would like to plant pine trees in our place. Please help us by referring us where we could purchase or ask for pine tree seedlings. Thank you very much. you may contact me at aryanz1003@yahoo.com.ph or 09228875166.